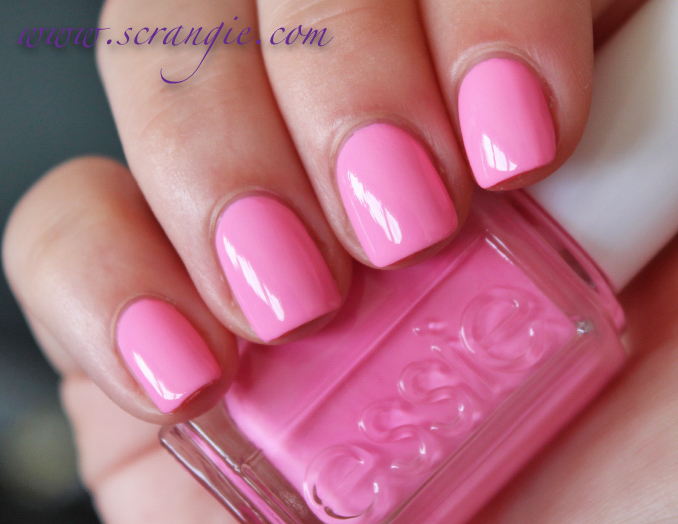 Essie always does really pretty neons and this year's neon collection is no exception. It's a little different this time around- they're jelly neons, not opaque cremes and they're not quite as fluorescent-bright as usual, but that's not a bad thing. They look like candy! Pale yet vibrant baby pink creme. 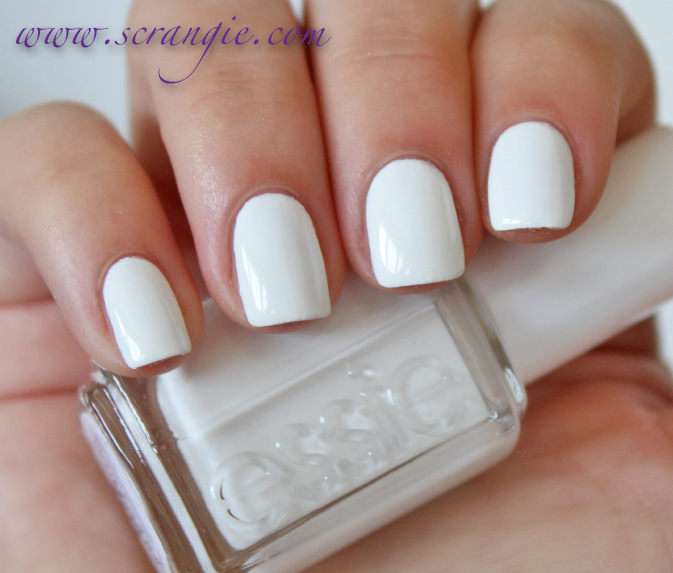 This is a true opaque creme, not a jelly. I wonder if the Boom Boom Room is on top of Boom Boom Mountain? Bright neon fuchsia jelly. Super saturated and glowy. Vibrant blue jelly-creme. Stunning. Dries darker than bottle color. 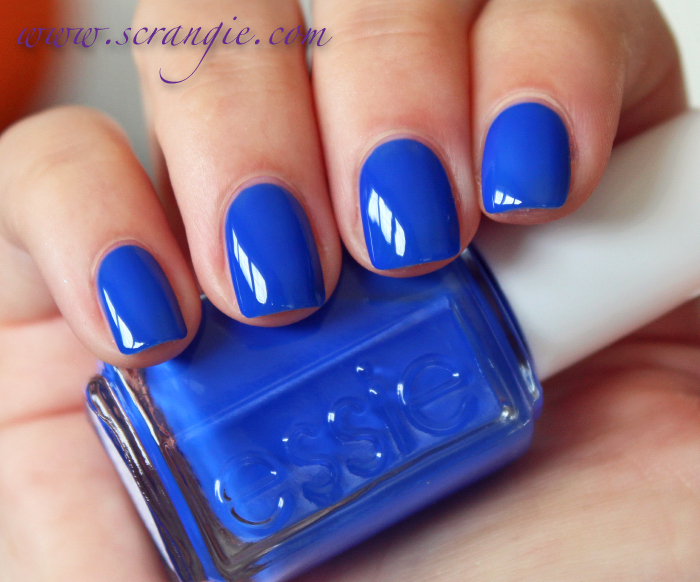 Essie DJ Play That Song. 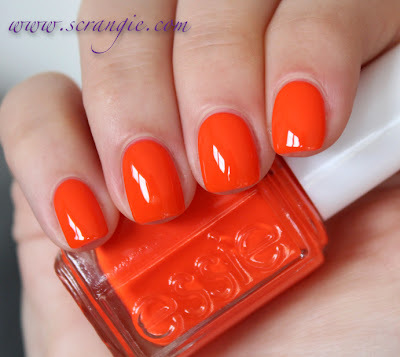 Blazing bright dark neon orange jelly. Essie Shake Your $$ Maker. I don't know if I'd call this one neon, but it is bright. Grassy, yellow-toned green jelly. The most sheer color in the collection. 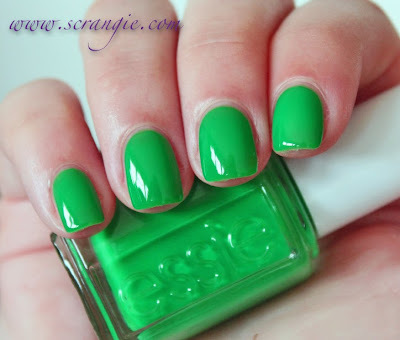 Makes me think of lime Jell-O! The formula on these was lovely. On the thicker side, but not gooey-thick. Just smooth, slower-flowing thick. Since these are jelly-finish polishes, they're sheer and need three coats for evenness and opacity. I still have some visible nail line at three coats. Four coats made these nearly entirely opaque, but I preferred the more translucent look of three coats. If you prefer a more opaque look, Essie recommends layering these neons over white. Layering over white can also brighten the color, but I'm just not a fan of this technique. Two coats of neon over three coats of Blanc. I think this looks sloppy and doesn't actually save any time unless you can manage to apply them completely evenly with only one coat each. Blanc is rather streaky and needs three coats to look even, so that's three coats of polish right there. Then the neons also look streaky applied over bright white, and that's another two to three coats. Five to six coats of polish, not even counting base coat or topcoat, and they still don't look as good as just applying the polish alone. I love these. All of them. They're bright and beautiful and the jelly finish makes them extra pretty. The downside is that they're pretty sheer, but they dry fast enough that it makes up for it. I wouldn't bother with the white layering thing, though. It's an extra time-consuming step and, if you ask me, completely unnecessary. These are available now on essie.com! Love Bouncer it's Me! So gorgeous! Wow, these neons are so incredibly saturated and gorgeous! Love them. They look awful over white! They're perfect as they are. Bouncer, it's me! is definitely my favourite of the whole lot. They're deliciously opaque for neons! whyyy do your swatches make me want to buy polishes i was never interested in before? "Two coats of neon over three coats of Blanc." That's a lot of coats, especially if you throw in a base coat and a top coat. Really, who's got the time? I'm thinking the people who buy jelly finishes do so because they like that look. LMAO a woman after my own heart with the Adventure Time reference... yeah the white base is completely unnecessary. The polishes are beautiful on their own. 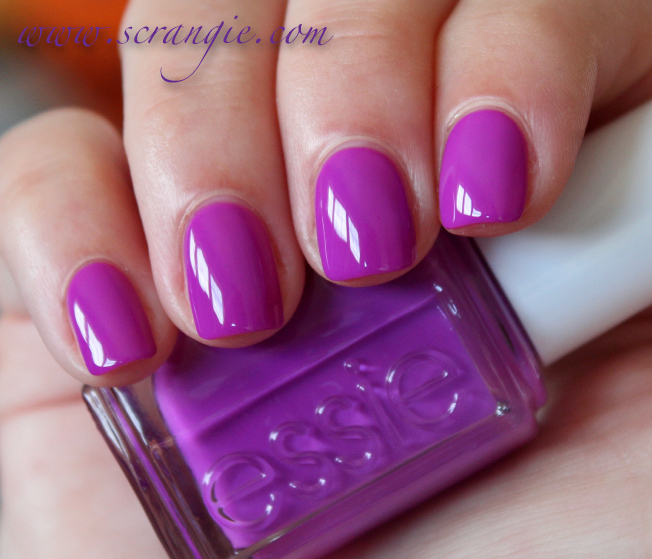 Essie polishes are always beautiful but I can't really get into them because I can't stand the brush. Anyone have tips? Excellent color and texture is great, I love them! 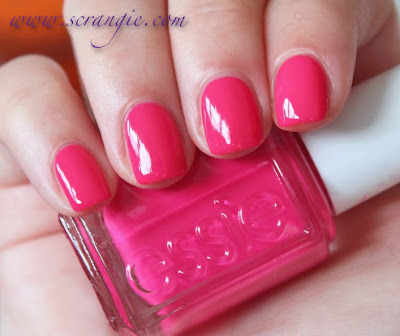 Bouncer It's Me looks like it could be a dupe for Rescue Beauty Lounge IKB, but even if it's not, I need it! I think that the boom boom boom is either a vengaboys reference or perhaps the outhere brothers song from the 90's. I am SO glad you find Blanc to be a three-coater. I know other people like it but I find it almost seems to get streakier as it dries?! I don't mind the idea of neons over white in theory, but it only really works if you use less coats overall. 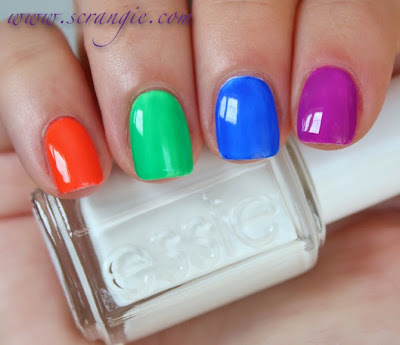 If you have to use 2/3 coats of white then the same of your colour then you might as well just do five of the neon. Your swatches are frustratingly gorgeous, as always.